It was a roller-coaster day for the Havemeister Dairy, its fans and its cows as its future ping-ponged between hope and doom while the House figured out what it was going to do the state dairy inspector, a position required for any dairy to sell its milk on store shelves. With the position already cut from the operating budget at the start of Wednesday’s floor session, a glimmer of hope came with a promising compromise before that hope dashed on a narrow vote. 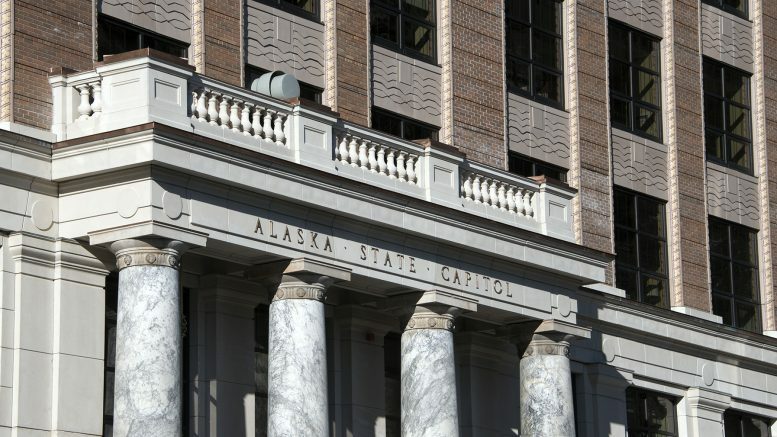 But that 20N-19Y vote wasn’t to be the end of it for Alaska’s dairy industry, and a later amendment fully funded the position with no strings attached. Rep. George Rauscher, the Sutton Republican whose district includes the Havemeister Dairy, brought forward the compromise amendment that would have partially funded the position by making cuts to other parts of the budget. It would have also directed the state to come up with a fee structure to cover the cost of the program moving forward. “Alaska says we’re open for business, but yet when we take the money out of the dairy business we’re going shut that farm down,” he said, noting that in addition to the direct employment at the dairy, the dairy is an anchor client for True North Plastics and a big buyer of Alaska-grown grain from Alaska Mill and Feed. It was a rousing speech for many, particularly as the many cuts proposed by Gov. Michael J. Dunleavy and Republican legislators have raised concerns about the state’s economic outlook. By cutting the $180,000 dairy inspector, Rauscher worried the economic impact would reach far beyond the dairy and dollars would be sent Outside. The Havemeister Dairy has warned that without a state dairy inspector it won’t be legally able to sell its milk on store shelves. According to the Mat-Su Valley Frontiersman, the cut would push the dairy into bankruptcy, forcing it to sell off its assets, default on a state loan and slaughter its cows. Rauscher’s amendment would have stepped down funding for the position and directed the state to begin working on a fee structure so the dairy could begin to help cover the costs of the inspections. “It’s going to be a net zero all the way down,” he said. But it was where that amendment took that stepped-down funding—a combination of cuts to the state’s Office of Information Technology and telecommunications budget—that caused problems for a narrow majority of legislators. The amendment was rejected 20N-19Y. That wasn’t the last word for the dairy, though, and a later amendment by Rep. DeLena Johnson, R-Palmer, restored the full funding for the position without taking it from other places in the budget, instead as an increase in undesignated general fund spending. It, too, added intent language directing the state to implement a fee structure to cover the program. Many legislators spoke in favor of the dairy industry, noting that there are other companies looking at getting in on the business. The House voted 24-13 to restore the funding. Work on the budget is set to continue in the House today at 10 a.m. The Senate is scheduled to begin work on the budget on Friday. The funding will also need to survive the threat of a line item veto by the governor. But at least for now, the Havemeister Dairy, its employees and its milking cows can rest easy. Be the first to comment on "After ups and downs, the House votes to restore funding for dairy inspector"